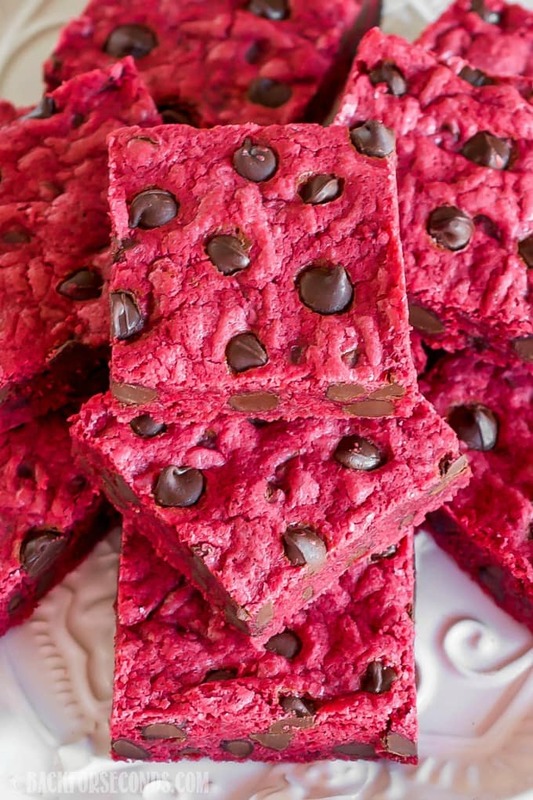 Red Velvet Chocolate Chip Bars are soft, chewy and loaded with chocolate! 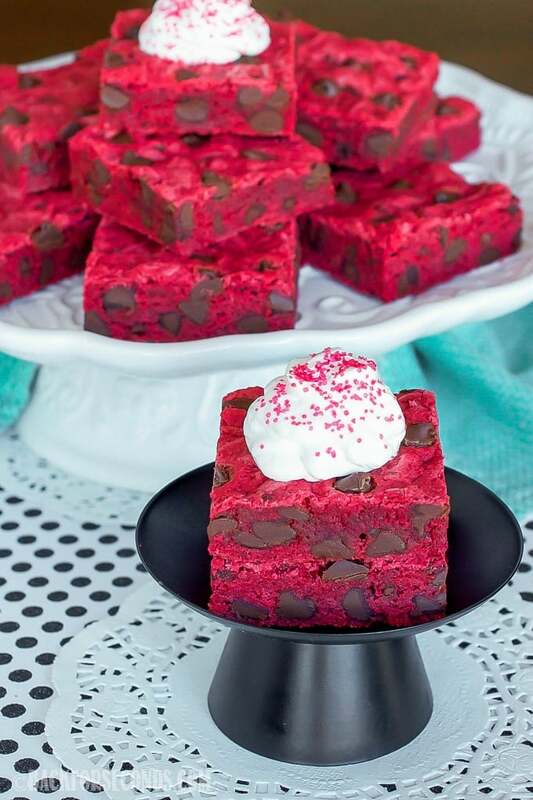 The perfect no-fuss dessert for Valentines Day, a birthday party, or just because! I am not really into making cutesy treats for holidays, but I do love a good themed dessert. My answer? 99% of the time COOKIE BARS! They can be made with very little effort and you can quickly jazz them up to fit any occasion without being a skilled decorator. 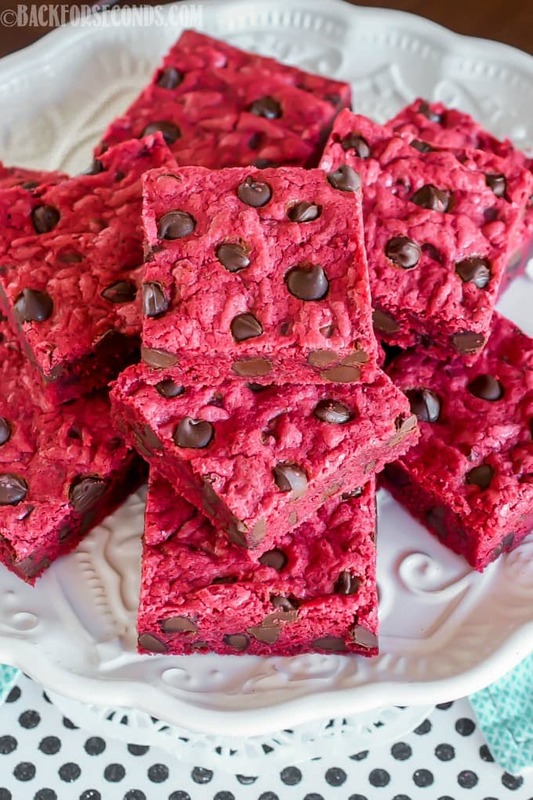 This recipe is one that I included in my cookbook, Brownies, Blondies, and Bars (which makes a great gift for just about any occasion, btw 😉 ). I love them not only because of the gorgeous, show stopping color, but because they are super duper easy to make and everyone always loves them! 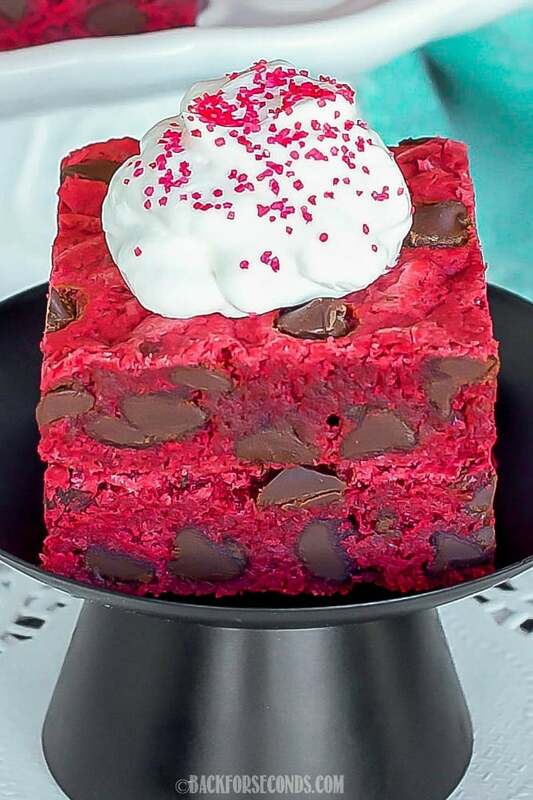 These would be so great for a Valentine’s Day party. You could even use a heart shaped cookie cutter to cut them into a more festive shape. Or add sprinkles just before baking to make them even more fun and colorful! I always make sure to slightly under bake these because I love the fudgy texture it gives them. Any way you slice them, these bars are sure to be loved by everyone who tries them. Enjoy! So festive for Valentines Day! They look really chewy and delicious! Oh my gosh. So brightly colored! 🙂 Such a fun treat for Valentine’s. In the ingredients list it says baking powder, but the instructions it says baking soda. Which one should be used? Sorry about that, Molly. It should say baking powder 🙂 Enjoy the bars!